If, like me, you can occasionally manage to sort out a hanging basket full of strawberries for the summer, but when winter comes there is just an empty hook, I have a novel little idea for you. As you may know, we are very proud of our garden now, since dad and hubby spent weeks decking our sloping area to make it both more usable and a really attractive area. Unfortunately, hubby has zero interest in gardening and I have zero time, so doing anything with the rest of the garden never seems to happen. I also never manage to put any food out for the birds, because my ridiculous cat would team up with my dog to harm the birds if they came too close. This is a shame, because there are some lovely wild birds around here and it would be lovely to see a bit more of them. 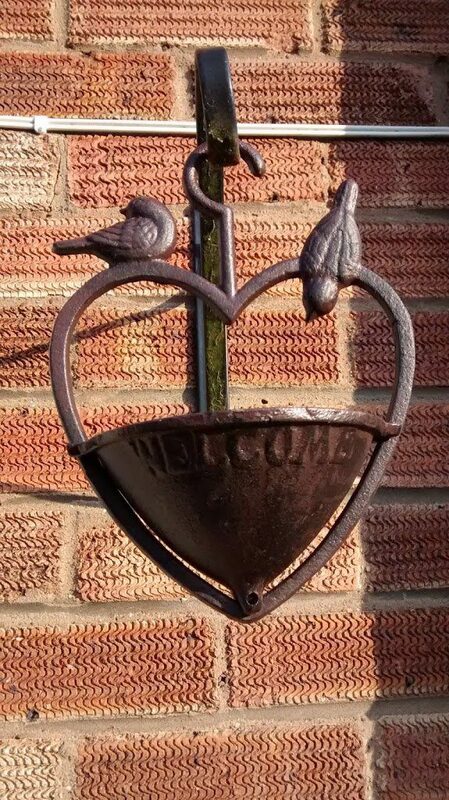 Luckily, Gardens2you have provided the perfect solution with this beautiful little cast iron hanging bird feeder. As you can see, it fits perfectly on my hanging basket hook and looks beautiful. This means that the cat, and even my lurcher who is rather a proficient jumper would never manage to reach the birds whilst they feed on there. The other thing I love about it is that it would be ideal for an urban environment, even for somebody living in a flat with no garden, since it just hooks on. Lets hope they catch on and less birds go hungry this winter! Please note, I was sent this product free of charge in return for an honest review of it. All views, opinions, terrible hanging basket skills and ridiculous cats are my own. Next Post Bring it on winter, I’m ready for you.